The response of the joint to anterior cruciate ligament (ACL) injury has not been fully characterized. In particular, the characterization of both catabolic factors, including interleukin-6 (IL-6), interleukin-8 (IL-8), and markers of ongoing tissue damage (CRP), and anabolic factors, including vascular endothelial growth factor (VEGF), transforming growth factor β-induced (TGFβI), and the presence of CD163+ macrophages, have not been well defined. In this study, we hypothesized ACL injury would catalyze both catabolic and anabolic processes and that these would have different temporal profiles of expression. Adolescent Yucatan minipigs were subjected to ACL transection. 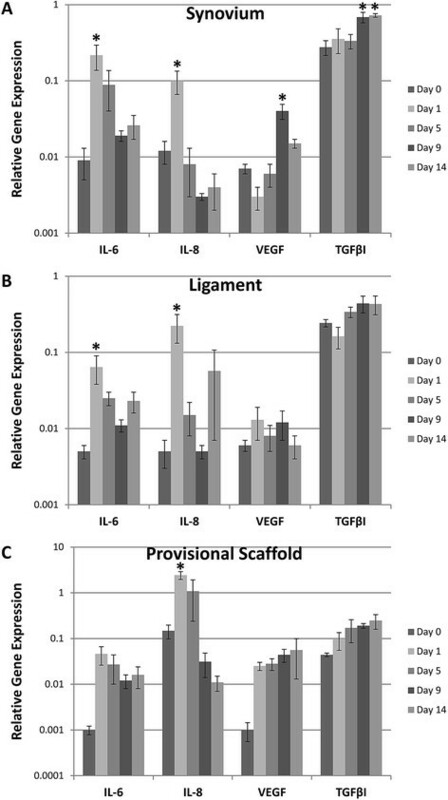 Within the joint, gene expression levels of IL-6, IL-8, VEGF, and TGFβI were quantified in the synovium, ligament, and provisional scaffold located between the torn ligament ends at days 1, 5, 9, and 14 post-injury. Macrophage infiltration was also assessed in the joint tissues over the two week period. Serum C-reactive protein (CRP) levels were measured at multiple time points between 1 hour to 14 days after injury. Increases in IL-6 and IL-8 gene expression peaked at day 1 after injury in the synovium and ligament. CRP levels were significantly increased at day 3 before returning to pre-injury levels. VEGF and TGFβI gene expression did not significantly increase until day 9 in the synovium and were unchanged in the other tissues. CD163+ macrophages increased in the ligament and synovium until day 9. Taken together, these results suggest that the response within the joint is primarily catabolic in the first three days after injury, switching to a more anabolic phase by nine days after injury. The effect of medications which alter these processes may thus depend on the timing of administration after injury. Injury and wound healing are complex processes. The early days after injury are typically marked by an influx of inflammatory cells, such as neutrophils, lymphocytes, and monocytes. The inflammatory cascade is critical in this initial phase of wound healing and facilitates wound debridement and cell recruitment. There are both catabolic and anabolic processes involved in this inflammatory stage. Prolonged catabolism may lead to excessive matrix degradation, while insufficient anabolic responses may lead to a failure of the wound to heal . Previous work in a large animal has shown that a delay of as little as two weeks between anterior cruciate ligament (ACL) injury and enhanced primary repair negatively affects the functional performance of the repaired tissue . The response to injury which develops over time is not yet fully understood, thus there is a need to understand the source of this negative effect as most patients would likely experience a delay between ACL injury and repair. Prior studies have reported that after injury in ligaments located outside the joint, as in the medial collateral ligament (MCL), an orderly progression of events occurs . There is an initial inflammatory phase which typically lasts up to 5 days . This is then followed by a proliferative phase which can last several weeks after injury . In those extra-articular tissues, the switch from catabolic to anabolic phase is thought to be mediated by the earlier infiltration of macrophages, fibroblasts, and endothelial cells, as deposited provisional extracellular matrix is slowly remodeled . However, while these similar histologic phases have been seen for the ACL after injury , it is less well-known how the changes seen in the ligament might be also reflected in the other tissues which may significantly affect the ligament response, namely, synovium and provisional scaffold. We hypothesized that inflammatory changes would be seen not only in the transected ACL, but also in these other important articular structures. The ACL does not live in isolation; rather, it is in the complex physiologic environment of the synovial fluid, where multiple tissues are metabolically connected by the synovial fluid. The synovial fluid is produced principally by the synovium  and bathes the ACL itself, as well as the wound site after ACL transection. To date, the majority of studies evaluating the inflammatory response after ligament injury have studied the ligament or explants of the ligament in isolation ,. For the first time, we are able to look at the simultaneous inflammatory response in both the ligament and the synovium lining the injured joint, both of which have the potential to influence the ligament response after injury. In addition, the blood clot which forms in the joint after injury is another possible source of inflammatory factors, given the relatively high number of leukocytes typically found in that structure in the first days after injury . We have selected synovium, ligament, and this provisional scaffold for examination in this study, as these three tissues in the intact knee are likely to influence the inflammatory response within the knee joint after ACL injury. In wound healing, the immediate post-injury phase is marked by an early increase in catabolic markers, including C-reactive protein (CRP), interleukin-6 (IL-6) and interleukin-8 (IL-8), which are typically seen within the first few hours to days after an insult or injury . Wound healing then shifts to anabolic functions, with a shift to the reparative, or M2 macrophage phenotype (CD163+), and production of factors that stimulate production of extracellular matrix and revascularization, such as transforming growth factor beta (TGF-β) and vascular endothelial growth factor (VEGF) ,. Recently, there has been interest in stopping or preventing the catabolic response after ACL injury in an effort to slow the early and irreversible loss of cartilage proteins seen after ACL injury -. However, the optimal timing of this intervention is unknown. We therefore wished to determine when the switch from primarily catabolic to anabolic inflammatory cytokines occurs after ACL injury. A wide variety of proteins have been identified as markers of early inflammation and wound healing response. IL-6 and IL-8 are pro-inflammatory cytokines which have been shown to be produced during the first 48 hours after an injury, increasing more than 10-fold and 20-fold, respectively, then decreasing over the next 2 weeks in male subjects with an ACL tear . IL-6 and IL-8 are considered important mediators of the acute inflammatory phase of wound healing, appearing in the joint immediately following ACL injury and persisting for approximately 1 week . IL-8 is also considered a main chemoattractant for neutrophils to the wound site, with slow clearance and long-lasting chemoattractant properties in the wound environment . CRP levels are often used as a measure of tissue damage, and elevated levels are observed in patients with ongoing cartilage loss associated with arthritis ,. Knowledge of these early markers of inflammation following ACL injury is of interest in both human patients and animal pathology models, in order to identify new treatment methods and their effects. In addition to catabolic cytokines, tissue injury stimulates expression of several anabolic factors. Members of the TGF-β superfamily have been found to be key anabolic factors, stimulating collagen production  and regulating wound healing, cellular proliferation and differentiation, and angiogenesis . TGFβ-induced (TGFβI) has been detected in various embryonic tissues of the knee during development, including cartilage, meniscal and ligamentous tissues . A lack of TGF-β signaling in the mouse has been shown to negatively affect knee development, resulting in a lack of menisci and cruciate ligaments critical to knee function . VEGF is a known stimulator of angiogenesis and revascularization of tissues ,, and expression in the inflammatory phase may contribute to cell migration and proliferation . Increased VEGF expression within the wound site has been correlated with vascular ingrowth, providing a source of nutrients, growth factors and cells to the injured area ,. The timing and source of these markers following ACL injury is of interest for future development of therapeutic strategies. Macrophages also play a central role in wound healing, accumulating at the site of injury and performing a wide variety of tasks, ranging from phagocytosis of debris to scar tissue formation and regulation of angiogenesis . Recent work has attempted to identify and classify macrophages along a spectrum determined by their means of activation, as well as their function. CD68 is highly expressed by monocytes and macrophages and is commonly used to indicate undifferentiated macrophages ,. After a period of time within the wound, macrophages, in particular, change to an alternatively activated, anabolic phenotype (CD163+ or M2). CD163+ macrophages release anabolic cytokines and secrete extracellular matrix (ECM) proteins, thereby playing a more positive role in the wound healing response ,. In this study, we hypothesized that ACL injury would result in an increase in early catabolic markers, particularly CRP, IL-6, and IL-8, in the first few days after injury. We also hypothesized than an increase in anabolic markers of the proliferative phase would be observed later in the two week period. Thirty adolescent Yucatan minipigs (Coyote CCI, Douglas, MA), aged 12–15 months, were obtained for use in this study. All minipigs were handled according to approved IACUC protocols at Animal Resources at Children’s Hospital (ARCH, Boston, MA). Twenty-four minipigs were subjected to ACL transection, followed by tissue harvest at 1, 5, 9, or 14 days post-injury. A group of 6 Yucatans was used to provide unoperated control specimens. Unilateral ACL transection was performed as previously described ,. Briefly, the ACL was exposed by performing a medial arthrotomy and partial resection of the fat pad. The ACL was cut using a scalpel blade at the junction of the proximal and middle thirds, functional loss of the ACL verified, and the knee closed in layers. 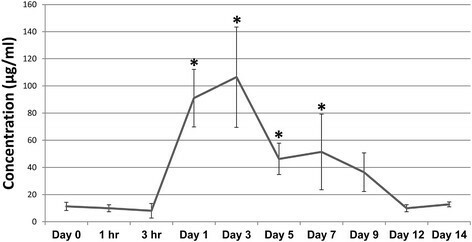 Minipigs were allowed normal nutrition and ad lib activity following surgery throughout the experimental period. The ACL, including any provisional scaffold matrix found on the end of the injured ligament, and medial synovium from each minipig were harvested after the specified time points from the injured knee of each subject (day 1, 5, 9, or 14, n = 6 for each time point) as previously described . Each tissue specimen was submerged in a cryovial containing RNALater (Ambion, Austin, TX, USA), flash frozen in liquid nitrogen, then stored at −80°C until analyses. A portion of the ligament tissue was also embedded within OCT medium (Sakura Finetek, CA, USA), frozen, and stored at −80°C for histological analysis. Synovium and intact ACL tissue were also harvested from six control subjects. Systemic blood of control minipigs was clotted to serve as a provisional scaffold control for the intact ACL group. The animals belonging to the groups sacrificed at day 9 and 14 were also subjected to serum draws at alternating time points. IACUC protocols demanded a break between anesthesia events. Therefore, one group was sampled pre-transection, then 1 h, 5 days, 12 days, and 14 days post-injury, while a second group was sampled at 3 h, 1 day, 3 days, 7 days and 9 days post-injury. Blood was collected in serum separator tubes, clotted at room temperature, centrifuged at 1000X g for 10 min, and the serum aliquoted in 500 μL aliquots and stored at −80°C. CRP concentrations in serum aliquots were quantified via the Pig C-Reactive Protein ELISA Test Kit (Life Diagnostics, Inc., West Chester, PA) according to the manufacturer’s protocol. The ligament, synovium, and provisional scaffold were examined for mRNA expression of several genes using real-time reverse transcriptase polymerase chain reaction (qPCR) run in duplicate as previously described . Briefly, total RNA was extracted from frozen tissue, treated with DNAse I, quantified, and reverse transcribed to generate cDNA. Primers are summarized in Table 1. Sybr Green PCR Mastermix (Applied Biosystems, Foster City, CA, USA), water, forward and reverse primer, and 10 ng cDNA were mixed and quantified in a reaction volume of 10 μl. No template controls were included to indicate contaminants or non-specific amplification and an Applied Biosystems 7900HT (Applied Biosystems) was used for amplification and detection. Level of gene expression was normalized to the housekeeping gene, GAPDH. Relative gene expression was calculated using the 2-ΔCt method . Ligament, synovium and provisional scaffold tissue specimens were sectioned (6 μm) and individually stained with CD163 (MCA2311, AbD Serotec, Raleigh, NC) and counterstained with hematoxylin (Mass Histology Service, Inc., Worcester, MA). No pre-treatment was required, and tissue sections were incubated in the primary antibody at a 1:250 dilution overnight at 4°C. The sections were then incubated for 45 min in the secondary antibody (Vector mouse ImmPRESS kit, Vector Laboratories, Burlingame, CA) followed by custom labeling with DAB for 1 minute. The time course of serum CRP levels was described using repeated-measures analysis of variance with an autoregressive covariance structure (PROC MIXED, SAS version 9.3, SAS Institute, Cary, NC). Gene expression was summarized as gene expression per cell, mean and standard deviation. Overall differences in gene expression levels (both across time for a particular gene and within each tissue) were assessed using a two-factor ANOVA followed by post-hoc Bonferroni-Dunn testing and one-way ANOVA to assess the effect of time on the gene expression in the individual tissues. P < 0.05 was considered statistically significant for all analyses. Statistical analyses were performed using SAS (version 9.2, SAS Institute Inc., Cary, NC) and Statview (version 5.0.1, SAS Institute Inc.). Serum CRP levels increased following ACL injury (Figure 1), with a significant increase (5-fold) over baseline observed at day 1 (P < 0.0001). CRP levels continued to rise and were significantly elevated (6-fold) over baseline at day 3 (P < 0.0001), then slowly returned to normal levels over the remainder of the two week period though significant increases over baseline were still observed at days 5 and 7 (P = 0.0361 and 0.0133, respectively). CRP concentrations in serum collected pre- and post-injury. Data represent mean concentration ± SEM. Asterisks indicate significance determined at P < 0.05 compared to baseline (Day 0) concentrations. Expression of IL-6 was significantly higher in the synovium when compared to the ligament and provisional scaffold (P < 0.01 for both comparisons) and peaked at day 1 after injury (P < 0.0001) where the levels of IL-6 gene expression in the synovium had increased by 20X over baseline (P < 0.001) (Figure 2A). The ligament had a 12-fold increase in IL-6 gene expression from day 0 to day 1 (P < 0.003) (Figure 2B) and the scaffold had a 46-fold increase in expression from day 0 to day 1 (P < 0.02, not significant) (Figure 2C). After the peak at day 1, levels in all tissues had significantly decreased by day 9 (P < 0.0001). Mean gene expression relative to GAPDH of IL-6, IL-8, VEGF, and TGFβI in the (A) synovium, (B) ligament, and (C) provisional scaffold following ACL injury. Note the log 10 scale on the y-axis. Error bars represent standard error of the mean and asterisks indicate significance determined at P < 0.05 within tissue type compared to baseline (Day 0) levels. IL-8 gene expression levels were significantly higher in the provisional scaffold when compared to the ligament and synovium (P < 0.0001 for both comparisons) and peaked at day 1 for all tissues (P < 0.0001). There the levels of expression were 10X higher in the provisional scaffold than in the synovium (Figure 2C). The provisional scaffold had a 16-fold increase in expression from day 0 to day 1 (P < 0.0001), while the ligament had a 44- fold increase in expression from day zero (P < 0.0025) (Figure 2B) and the synovium had an 8-fold increase in expression from day zero to day 1 (P < 0.001) (Figure 2A). Levels in all tissues had significantly decreased by day 9 (P < 0.0001). A significant increase in VEGF gene expression from baseline levels was noted in the synovium at day 9 (P < 0.0001). VEGF gene expression levels were significantly higher in the provisional scaffold when compared to the ligament (P < 0.008), but not significantly different from the synovium (P < 0.04). On average, the gene expression levels of VEGF were 2.5X higher in the provisional scaffold than in the ligament (Figure 2). TGFβI expression levels significantly increased in all tissues over the course of the experiment (Figure 2, P < 0.0001 for all comparisons between day 0 and days 9 and 14, as well as between day 1 and days 9 and 14). TGFβI gene expression levels were significantly higher in the synovium when compared to the ligament and provisional scaffold (P < 0.001 for both comparisons) and were higher in the ligament than in the provisional scaffold (P < 0.0008). In the intact ligament, very few CD163+ cells were seen (Figure 3B). Following ACL injury, CD163+ cells increased in number within the ligament, as well as within the synovium and provisional scaffold. The highest concentrations of CD163+ cells were observed at days 9 (Figure 3I, J, and K) and 14 in the synovium, ligament, and provisional scaffold (Figure 3L, M, and N). Light microscopy images of CD163 antibody stained histological sections obtained from the synovium (A, C, F, I, L), ligament (B, D, G, J, M), and provisional scaffold (E, H, K, N) at days 0 (A,B), 1 (C, D, E), 5 (F, G, H), 9 (I, J, K), and 14 (L, M, N) following ACL injury. Scale bar represents 50 μm. In the ACL injury model, even without direct injury to the synovium in the areas evaluated, an initial catabolic response was seen in both the ligament and synovium. Specifically, IL-6 and IL-8 were significantly upregulated at day 1, returning toward normal levels by day 5. This was reflected in the systemic blood, as well with an increase in CRP levels in the plasma peaking at day 3. Taken together, these changes suggest that an ACL transection results in an immediate coordinated catabolic response by the synovium as well as the ligament. While there were no significant indicators of anabolic function in the ligament tissue, the synovium had significant increases in the gene expression of both VEGF (day 9) and TGFβI (days 9 and 14) later in the time course, suggesting that while a productive response to injury may be occurring in the synovium, it is less clear this occurs in the transected, intra-articular ACL. This would be consistent with prior reports of the failure of the transected ACL to mount an effective healing response ,. Following ACL transection, CRP levels peaked at 3 days following injury, exhibiting a strong correlation to human patients undergoing ACL reconstruction, where mean CRP levels increased significantly the first post-operative day, peaked on day 3, and returned to baseline levels by day 15 . Similar results were also observed in the plasma of human patients undergoing ACL reconstruction, with significantly increased plasma CRP levels noted 3 days after the operation, which returned to preoperative levels by 2 weeks post-surgery . In addition, these data suggest the porcine model has a similar CRP response to the human knee, and therefore may be a reasonable surrogate for studying human joint injury. There are multiple candidate theories for the observed switch from catabolic to anabolic processes within the joint after ACL transection. Here, IL-6 and IL-8 gene expression levels were both seen to peak at day one in both the ligament and synovium before declining, which is consistent with reports of human synovial fluid levels following ACL injury . IL-8 in particular is released by neutrophils in the wound site. These cells undergo apoptosis within 1 to 3 days, and engulfment of the apoptotic neutrophils can change the wound macrophages from a catabolic phenotype to an anabolic phenotype (CD163+), where they release VEGF . Indeed in this study, we see an increase in VEGF expression within the synovial tissue at day 9, as well as an increase in CD163+ macrophages, particularly within the wounded ligament at this same time point. Thus, the IL-8/neutrophil/macrophage axis may be particularly relevant in this injury model. These results correlate with similar studies of synovial fluid human patients where a peak in IL-6 levels was observed within 24 hours after ACL injury and an increase in IL-8 levels was apparent within 3 days of injury before declining . Interestingly, persistent presence of higher levels of IL-6 in the synovial fluid was correlated with painful ACL injuries; non-painful knees did not have elevated levels of IL-6 . Increased interferon gamma and macrophage inflammatory protein beta concentrations were also observed in the synovial fluid of these injured patients . Another study in humans with ACL tears similarly observed elevated IL-6 and IL-8 levels in the synovial fluid initially, which decreased in concentration rapidly within 3 days of injury . A similar peak was also seen in tumor necrosis factor alpha (TNF-α), IL-1β, and interleukin-1 receptor antagonist (IL-1RA) concentrations in these patients, however, TNF-α levels remained relatively high through 2 weeks and IL-1β and IL-1RA were high until 6 days after injury . Previous work by Nakahara et al. indicated that IL-6 induces VEGF production in human synovial fibroblasts . In this study, IL-6 gene expression levels peaked at day 1, followed by a significant increase in VEGF gene expression levels at day 9 in the synovium. VEGF concentrations in the drain fluid of patients undergoing ACL reconstruction were also found to significantly increase with time from surgery . In studies of reconstructed ACL graft tissue, the highest vascularity was observed between 6–12 weeks ,. In transected ACLs treated with a suture repair plus a collagen-platelet composite sponge, blood vessel concentration at the insertion site was greatly increased at both 2 and 4 weeks in the adolescent injury model . Thus, the initial inflammatory response may elicit VEGF gene expression and result in increased angiogenesis within the native ligament tissue. This study focuses on changes within the first two weeks of ACL injury, though other studies have evaluated the changes in gene expression in joint tissues at longer time points ,. Naraoka et al. 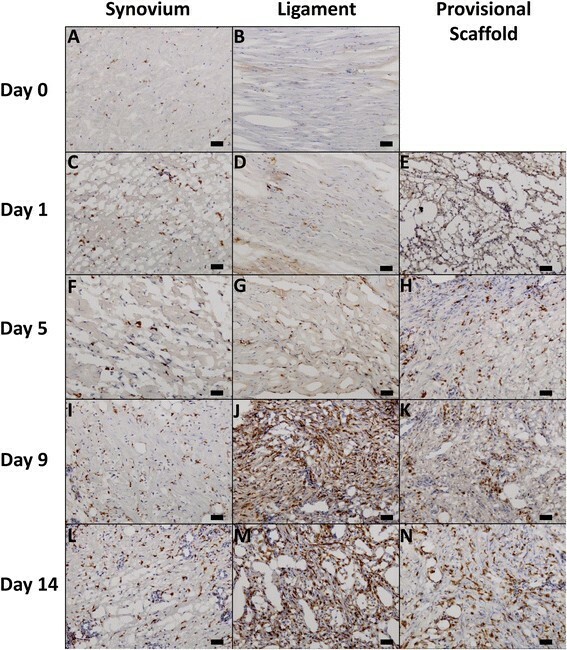 found increased IL-6 gene expression within the first three weeks after injury in human ACL tissue, as well as an increase in Collagen I gene expression in the 3–8 week timeframe . Additionally, in a 6 week study in rabbits, Attia et al. noted increased MMP-13 gene expression in the ligament at 1 week, with increased Collagen I and III gene expression at the 6 week time point . However, these studies often evaluated a single tissue rather than three joint tissues, the ligament, synovium, and provisional scaffold, simultaneously. Future studies to evaluate the simultaneous joint changes at longer time points are planned. TGFβI expression was found to increase in all joint tissues after ACL injury, with a peak increase seen at 9 days after injury. In prior studies, mRNA levels of TGFβI have been shown to increase following macrophage engulfment of apoptotic cells . Dose and time effects of TGFβI treatment were also shown to regulate collagen levels in cultured fibroblasts, suggesting regulation may occur through excretion of soluble factors by the macrophages . These results suggest that TGFβI may act as a mediator of the pro-fibrotic effects exhibited by macrophages following ingestion of apoptotic cells . Previous analyses from ACL injured and normal patients have also shown a significant increase in both type I and type III collagen gene expression in injured patients compared to normal expression in the ligament . Furthermore, in a study of patients undergoing ACL reconstruction, TGF-β and platelet-derived growth factor (PDGF), which promotes cell migration and plays a significant role in angiogenesis, were found to rapidly increase in protein concentration in the drain fluid within 6 hours of surgery . These increases in anabolic proteins indicate there is a potential to mount a scarring response followed by healing after ACL injury, however, the resulting non-functional scar may be due to the early increase in catabolic proteins. The presence of CD163+ macrophages was found to increase after injury, plateauing at day 9. In other wound healing models, macrophages have been found to migrate from the peripheral blood toward a gradient of chemoattractants, eventually accumulating at the wound site. The CD163+ macrophages have previously been associated with anabolic wound healing activities, including stimulating increased collagen production in fibroblasts following ingestion of apoptotic debris ,. The CD163+ phenotype has been described as the hallmark of the wound healing macrophage, dampening the effects of oxidative injury from hemolysis during bruising or tissue injury, and transitioning into this “resolving macrophage” phenotype with increasing time from injury- even in less traumatic skin blistering models . Thus, their presence in the later phase of the response to ACL injury may be another marker of the shift from catabolic to anabolic processes in the joint. The early biological changes which occur following ACL injury are believed to play an important role in subsequent joint health. In addition to the ligament’s limited capacity to heal without surgical intervention, which largely serves to impart mechanical stability to the injured joint, post-traumatic osteoarthritis has been shown to develop within 10–20 years in more than 50% of individuals who experience an ACL tear . Loss of proteoglycan and collagen molecules from cartilage has been shown within the first few weeks after injury ,. Neuman et al. observed evidence of reduced glycosaminoglycan content in cartilage from patients examined at 3 weeks and 2.3 years after ACL injury . We have similarly shown an increase of type II collagen fragments in synovial fluid, which nearly doubled within 5 days of ACL injury . Thus, knowledge of, and intervention in, the catabolic pathways initiated by ACL rupture may help prevent further damage to both the ligament and cartilaginous structures after injury. A few study limitations should be noted. Most importantly, an animal model was required to allow for tissue harvest at various time points after injury. Thus, it is possible that the timing of CRP production, cytokine gene expression, and macrophage infiltration may be different in humans; however, the CRP  and IL-6  profiles reported here closely matches that previously reported for humans with ACL injury. The porcine model was chosen in part due to its size, ACL dependency, and gait similarity to humans -. There is extensively conserved homology between the porcine genome and the human genome, far more than between human and mouse or other rodents . The pig is therefore an important model for human health, particularly for understanding complex traits such as wound healing, obesity, and cardiovascular disease -. In addition, the porcine knee is approximately the same size as the knee of a small human, thus diseases which may be dependent on tissue size are more easily modeled in this organism, as has already been shown for retinitis and diabetes ,. This model has been used to study ACL injury and surgical and tissue engineering approaches for healing, thus allowing for comparisons and further insight into the biological mechanisms following injury -. The minipig also serves as a model for other human conditions, including testing of diabetes drugs and mechanical heart valves, and even serves as a source of donor tissue for prosthetic aortic valves -. Additionally, mRNA expression is reported here, however, expression levels may not directly correlate with protein release. Another limitation was the control tissue specimens were obtained from a separate group of animals as altered gait due to ACL injury could potentially affect the tissues of the contralateral knee. ACL injury, similar to other wound responses, has both a catabolic and anabolic response. In this study, we report that while the catabolic factors evaluated in this study are active primarily in the first three days after injury, the anabolic factors studied here become more prominent at a week or more from injury. Future studies aim to regulate these processes, with the goal of minimizing the catabolic phase of tissue destruction and accelerating the anabolic phase of tissue repair. The authors thank the ARCH staff, Dr. Arthur Nedder, Mrs. Kathryn E. Donovan, Ms. Dana Bolgen, and Ms. Courtney White, for their assistance and care in handling the minipigs. We would also like to thank Drs. Casey Theriot, Sebastian Kalamajski, and Justin Allen for their assistance in qPCR design and Elise Magarian, Ryu Yoshida, and Dr. Patrick Vavken for their assistance in surgery and tissue collection. The authors also thank Dr. Henry A. Feldman for his assistance with statistical analysis under the support of the Harvard Clinical and Translational Science Center (Catalyst) under NIH 8UL1 TR-000170. This investigation was supported by National Institutes of Health under NIAMS AR054099 (MMM) and the Ruth L. Kirschstein National Research Service Award (F32 AR061186) (CMH). Dr. Haslauer’s salary was also supported by Dr. Matthew Warman, the Children’s Orthopaedic Surgery Foundation, and the Harvard Medical School. The content is solely the responsibility of the authors and does not necessarily represent the official views of the National Institutes of Health. CMH and BLP carried out the operating room techniques and tissue collection; CMH and AH designed the primers used in qPCR; VJ performed the statistical design and analysis; MMM conceived and designed the study, as well as edited all drafts of the manuscript. All authors read and approved the final manuscript.